Woodcock season opened the 25th of September this year, the day Mika and I returned from our holiday in England. The next day, the 26th of September, I took Hera on her first hunt. She is almost one year old and been in training up to this date. My hunting buddy Jason Quinn and his dog Nos, a German Wirehaired Pointer, joined us for Hera’s first hunt. We left Ottawa after work for the Marlborough Forest, driving to a patch of cover I call Lester’s Square. This is a spot in the forest that can be counted on to attract woodcock during their Autumn migration, especially when the terrain is nice and wet. We arrived at about 4:00 pm and set out. On the drive out I noticed the water levels in the marshes and beaver ponds along the way were higher, which I found encouraging. Sure enough, the cover at Lester’s Square was nice and boggy. It should make for a good season. Hera and Nos run well together, they quarter through the cover with enthusiasm. We made our way anticipating points and flushes, but woodcock proved scarce. We had two ruffed grouse flush wildly and unseen in thick brush. Ruffed grouse in the Marlborough Forest have adapted to being hunted every Autumn, making them very challenging game. As we were well into our sweep of the cover, Nos pointed a woodcock. Nos remained steady to wing and shot and the bird was dumped cleanly in view of Hera by Jason, using his new Beretta over and under. We let Hera examine the downed woodcock and continued the hunt, though no more birds were seen. The woodcock migration likely has not started yet. We will return to hunt Lester’s Square as the season progresses in hopes of intercepting some of the migrants. It was a good first hunt for Hera and I look forward to taking to the field with her anew very soon. 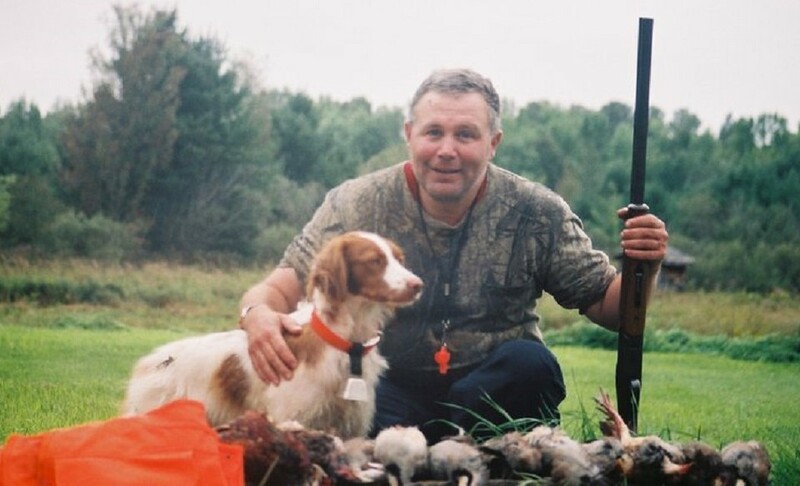 This entry was posted in Brittany (dog), Gun dogs, Hunting dogs, Pointing dogs, Ruffed grouse hunting, Small game hunting, Upland bird hunting, Woodcock hunting and tagged autumn migration, beaver ponds, Beretta, Brittany (dog), coverts, first hunt, game birds, German Wirehaired Pointer, Gun dog, Hera, Hunting, Hunting dog, Jason Quinn, Lester's Square, Marlborough Forest, migration, pointer, pointing dog, Ruffed grouse, thick brush, upland game, upland gunning, water levels, Woodcock on September 29, 2013 by geoffreyandmika.